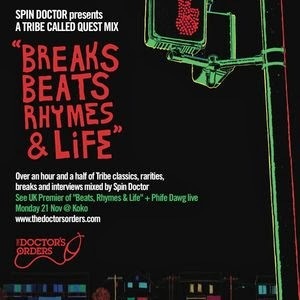 Ahead of the UK premier of A Tribe Called Quest documentary 'Beats Rhymes & Life' followed by a live performance by Phife Dawg himself on 21st & now 22nd Nov (get tickets and info here - www.thedoctorsorders.com) Spin Doctor creates a phenomenal mix dedicated to the greatest Hip-Hop group of all time. This blend Tribe classics, the original breaks used to create them and a couple of rarities, all spliced with interviews with Tribe from the film and way beyond runs at 1 hour 40 mins. Done in chronological order by album this passion project is a must for anyone with a love of Hip-Hop, Jazz, Soul & the art of sampling.